A chic but cheap face cleanser | Chic first: an elegant view on beauty, fashion and lifestyle. After a few shopping sprees I’ve recently done in both London and Milan, it’s now time to rein it in, so today I’ll show you a product that helped me save some money, although delivering very good quality. Before trying the Nutriganics Softening Cleansing Gel Oil from The Body Shop, I thought that a chic face cleanser could be available only at a quite expensive price. To be honest, I still think so, especially if you care about organic-sourced ingredients and high quality natural oils. But what if you’re simply looking for a product to wash your face in the morning? So basically you haven’t got heavy make up to remove, or waterproof mascara on the lashes. 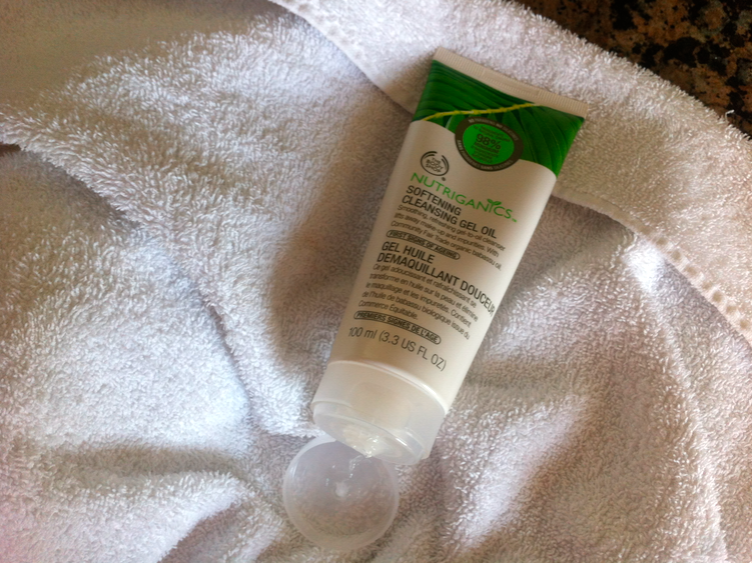 Well in this case, the Nutriganics Softening Cleansing Gel Oil is awesome! I use a tiny amount of this everyday as part of my AM skincare routine. I apply it on the dry face, wet my hands to emulsify and then, with a wet hot cloth I remove it. I end up with a splash of cold water and I pass to the other steps. It’s cheaper than other products. No negative reactions on my super delicate and intolerant skin. It’s not a make up remover, so you’ll need a different product in the evening. I know the producer declares you can use it to clear up the skin from make up, but believe me, you’ll find lots of residues and it will not work properly to remove mascara. This entry was posted in Beauty, Fall/Winter, Shopping, Skin care and tagged beauty, chic, chicfirst, cleanser, skincare, The Body Shop. Bookmark the permalink. Nice to know it works on sensitive skin!